With the introduction of the Gold Mini, Cort introduces a guitar with all of the features players love about the Gold-D6 dreadnought, at 3/4 of the size. The 19-fret, 22.8-inch scale makes this mini acoustic ideal for travelers who want a high-quality instrument that doesn’t sacrifice sound for portability. The Gold Mini can also be suitable for female players or children who seek a smaller-size instrument. Another important distinction between the Gold Mini and its larger Gold Series counterpart is the torrefied solid Adirondack spruce. 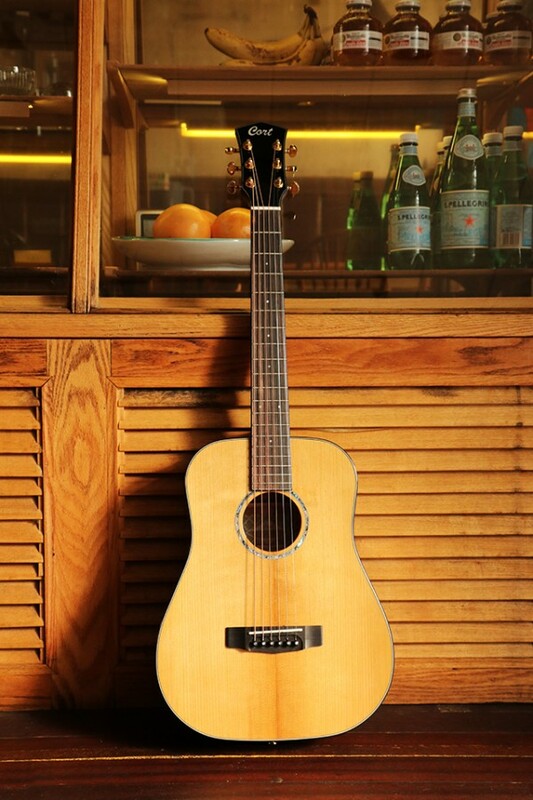 Stronger and denser than Sitka spruce, Adirondack is characterized by its broad dynamics as well as its articulation and smoothness at a high volume. This sonic quality is made possible through a special process called ATV (Aged to Vintage), in which the top is treated in a way that gives it a big, open tone of a decades-old vintage acoustic. Cort has also spent time on the modernized X-bracing on the top, which has been aggressively scalloped to free up added top vibration. Cort’s sonically enhanced UV finish for acoustic models like the Gold Mini is thinner and designed to be less constrictive on the instrument, contributing to its sonic excellence. Many of the essential designs of the original Gold-D6 NAT have carried over to the Gold Mini design. The back and sides of the Gold Mini are solid mahogany, as well as the neck, which is supported by a double-lock neck joint. The traditional dovetail is reinforced by an added bolt that maximizes the transfer of tone while enhancing resonance. 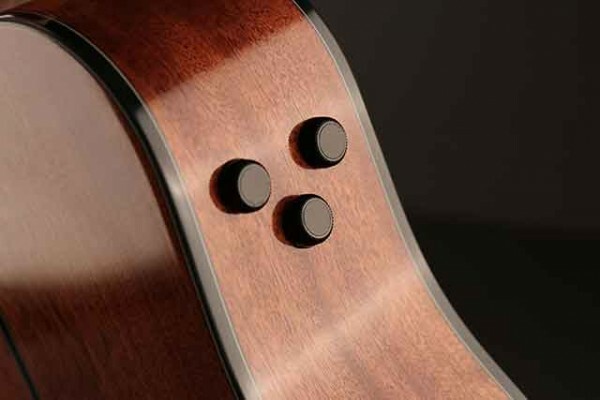 The neck is reinforced with two pieces of walnut for added rigidity and stability. 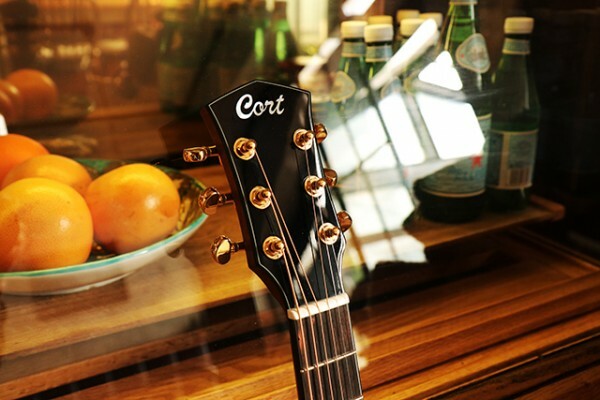 Macassar ebony is used to enhance playability on the fretboard, and the same wood is used on the bridge, which enhances the guitar’s natural tone. Playability is also improved by the Gold Series’ new neck profile, featuring a rounded fingerboard edge for added comfort. The Gold Mini represents the classic sophistication of the Gold Series with its abalone rosette and black binding with triple-ply purfling. Die-cast gold tuners offer an 18:1 tuning ratio, ensuring precise tuning adjustment with smoothness and the highest-quality functionality. An additional model with onboard preamp electronics is also available. The Gold Mini is ideal for players on the go who want to travel light, and comes with a deluxe soft-side case.